"Honor made him a man. Courage made him a hero. History made him a legend." 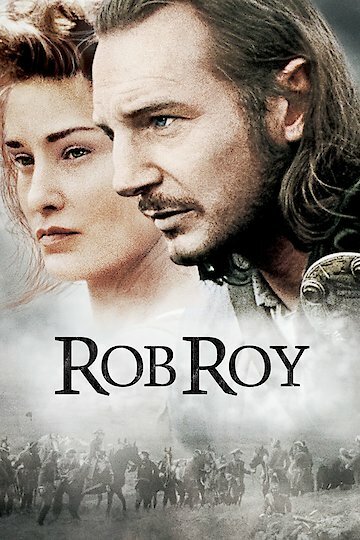 Based loosely on historical figures and events, Rob Roy, starring Liam Neeson, Jessica Lange, John Hurt, and Tim Roth is an action drama set in 18th century Scotland. Rob Roy MacGregor (Neeson) is a cattle drover and the leader of his clan hoping to relieve the famine that plagues his village he secures a line of credit of £1000 from the Marquis of Montrose (Hurt). He believes that if his clan can raise enough cattle their problems will be over and they will be able to repay the loan. However one of the Marquis's men, Archibald Cunningham (Roth), learns of the loan from Montrose's factor who then arranges for the credit to be converted to cash without MacGregor's knowledge. Cunningham kill's MacGregor's best friend and steals the money planning to stick Rob Roy and the Clan with repaying a loan they never received. Forced to become an outlaw, Rob is hunted by Cunningham but must find a way to clear his and the clan's name and right the wrongs done to him and his family. Rob Roy is currently available to watch and stream, download, buy on demand at Amazon Prime, Amazon, Vudu, Google Play, iTunes, YouTube VOD online.